Always know when a product is shipped from your own warehouse, or is being sent via a drop ship vendor or fulfilment center. xocbox Management System and Back-Office enterprise-class tools give you the ability to manage your online catalog, track inventory through multi channels, and keep online stock levels accurate. You will always know when a product is shipped from your own warehouse or storage area, or is being sent via a drop ship vendor. Shipper tracking notices keep you and your customers informed at all times. xocbox provides you with more visibility in the supply chain process via EDI and integration with third party APIs for fulfilment, shipping and logistics. Automate your processes, sell more products, work with more suppliers, and free up time for your employees. xocbox provides you with an affordable, fully integrated EDI system, eliminating data entry and enabling you to transmit documents directly to your suppliers and customers. 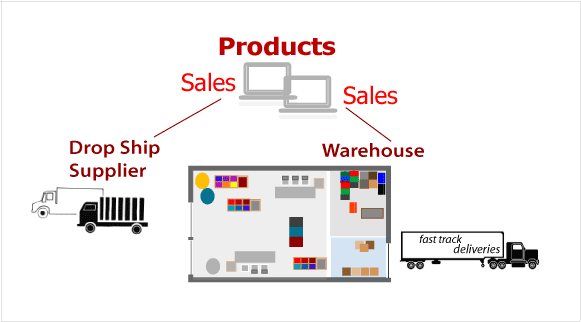 If you are not already using drop ship vendors, xocbox works with you and your vendors to integrate inventory and track sales. The xocbox SKU catalog system gives you the ability to make use of drop shippers and efficiently track goods from warehouse to customer. Benefits of drop shipping include the ability to offer a wide selection of products without tying up large amounts of capital in inventory. You can also try out new product lines for sale without having to purchase a new line, or minimum order quantity. You also have the opportunity to use a fulfillment center. The ability to sell and efficiently track products sold, whether sales are online, via mobile devices, or bricks and mortar stores can be done usine the xocbox back-office. An efficeint way to monitor inventory sold, returned, and available. Have real-time inventory stats available, and show customers whether merchandise is in stock when they shop. Ensure that shoppers are offered a second choice product to keep them shopping in your store.